Thanks for stopping by. 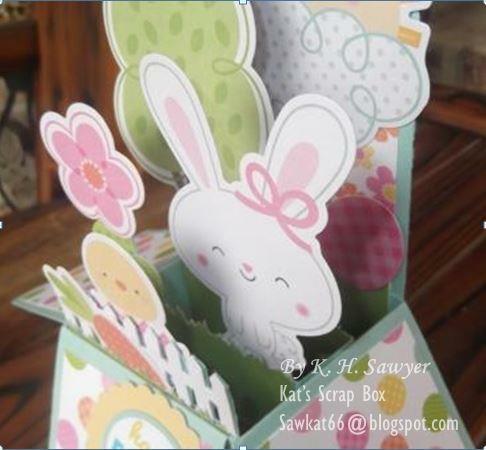 Today's Easter cards are fun and bright box cards. Remember, these cuties fold flat for mailing. Notice anything wrong? Silly me. I didn't notice the sentiment was upside down, until I saw the photo. The tree in this one was see-through, which did go well with the light behind the layer, do I traced it on white paper and cut it out; placed it behind with some clear no-show adhesive. PLEASE NOTE: I like to do a linky-party with prizes in May if I can get 40+ followers. So if you like my post be a sweetie and follow me. Be sure to come back in may for a linky challenge and prizes. Thanks so much for looking. God Bless and Happy Crafting. 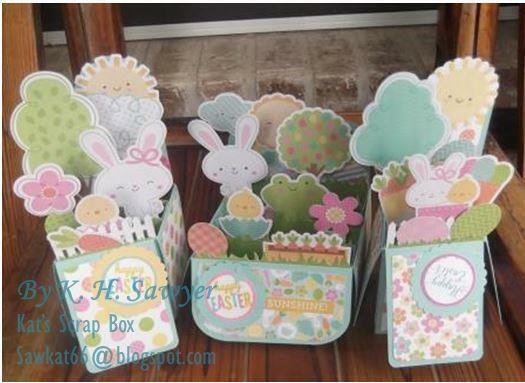 delightful set of Easter cards! Oh wow! These are fabulous!!! Thanks so much for linking your awesome box cards up to the CropStop challenge! Total cuteness in a box.Thank you for joining us at Inkspirational Challenges. Congratulations you are one of the Top Rockers at 613 Avenue Create - don’t forget to pick up your badge from the Top Rocker page.